Learning Objective Prompt: Define the age of expansion and conquest and explain how, why, and when it developed. The age of expansion and conquest is a term used to describe the geographical, political, and commercial expansion --which took place between the 1450's and 1650, as the nations of Europe searched for a new trade route to the Orient which led to the conquest of new lands and trade routes. In order to understand how the age of expansion and conquest developed, it is important to understand the "internal development growth process." Two factors helped bring about this "process" : (1) the Crusades and (2) the Black Death . The Black Death from 1347-1350, was another major factor which helped bring about the transformation of Europe during the Middle Ages . The population reduction cannot be accurately estimated, but figures range from 20 to as high as 50%. Death tolls of this magnitude threw the European social order into chaos. Feudal nobles lost their peasants, and peasants lost their lords. Security of the peasants was jeopardized by the death of nobles and the death often served as an invitation for expansion by an aggressive neighbor. (6) led to the development of the bourgeoisie or business and merchant class. All of these interrelated activities led to the breakdown of the self-sufficiency of the manor, which had rested on the use of products available within its confines . European nation-states consolidated under the authority of powerful kings. A series of military conflicts between England and France–the Hundred Years War–accelerated nationalism and cultivated the financial and military administration necessary to maintain nation-states. In Spain, the marriage of Ferdinand of Aragon and Isabella of Castille consolidated the two most powerful kingdoms of the Iberian peninsula. The Crusades had never ended in Iberia: the Spanish crown concluded centuries’ of intermittent warfare–the Reconquista–by expelling Muslim Moors from the Iberian peninsula in 1492, just as Columbus sailed west. With new power, these new nations–and their newly empowered monarchs–yearned to access the wealth of Asia. Seafaring Italian traders commanded the Mediterranean and controlled trade with Asia. Spain and Portugal, at the edges of Europe, relied upon middlemen and paid higher prices for Asian goods. They sought a more direct route. And so they looked to the Atlantic. Portugal invested heavily in exploration. From his estate on the Sagres Peninsula of Portugal, a rich sailing port, Prince Henry the Navigator (Infante Henry, Duke of Viseu) invested in research and technology and underwrote many technological breakthroughs. His investments bore fruit. In the fifteenth century Portuguese sailors innovated the astrolabe, a tool to calculate latitude, and the caravel, a ship well-suited for ocean exploration. Both were technological breakthroughs. The astrolabe allowed for precise navigation and the caravel, unlike more common vessels designed for trading on the relatively placid Mediterranean, was a rugged, deep-drafting ship capable of making lengthy voyages on the open ocean and, equally important, carrying large amounts of cargo while doing so. Blending economic and religious motivations, the Portuguese established forts along the Atlantic coast of Africa during the fifteenth century, inaugurating centuries of European colonization there. Portuguese trading posts generated new profits that funded further trade and further colonization. Trading posts spread across the vast coastline of Africa and by the end of the fifteenth century Vasco de Gama leapfrogged his way around the coasts of Africa to reach India and lucrative Asian markets. The vagaries of ocean currents and the limits of contemporary technology forced Iberian sailors to sail west into the open sea before cutting back east to Africa. So doing, the Spanish and Portuguese stumbled upon several islands off the coast of Europe and Africa, including the Azores, the Canary Islands, and the Cape Verde Islands. They became training ground for the later colonization of the Americas. Sugar, a wildly profitable commodity originally grown in Asia, had become a popular luxury among the nobility and wealthy of Europe. The Portuguese began growing sugar cane along the Mediterranean, but sugar was a difficult crop. It required tropical temperatures, daily rainfall, unique soil conditions, and a fourteen-month growing season. But with the Atlantic Islands, the Portuguese had found new land to support sugar production and new patterns of human and ecological destruction followed. Isolated from the mainlands of Europe and Africa for millennia, island natives—known as the Guanches—were enslaved or perished soon after Europeans arrived. Portugal’s would-be planters needed laborers to cultivate the difficult, labor-intensive crop. Portuguese merchants, who had recently established good relations with powerful African kingdoms such as Kongo, Ndongo, and Songhai, looked to African slaves. Slavery had long existed among African societies. African leaders traded war captives—who by custom forfeited their freedom in battle—for Portuguese guns, iron, and manufactured goods. From bases along the Atlantic coast, the largest in modern-day Nigeria, the Portuguese began purchasing slaves for export to the Atlantic islands. Slaves would work the sugar fields. Thus were born the first great Atlantic plantations. Spain, too, stood on the cutting edge of maritime technology. Spanish sailors had become masters of the caravels. And as Portugal consolidated control over its African trading networks along the circuitous eastbound sea route to Asia, Spain yearned for its own path to empire. Christopher Columbus, a skilled Italian-born sailor who studied under Portuguese navigators, came calling. Educated Asians and Europeans of the fifteenth century knew the world was round. They also knew that while it was therefore technically possible to reach Asia by sailing west from Europe–thereby avoiding Italian or Portuguese middlemen–the Earth’s vast size would doom even the greatest caravels to starvation and thirst long before they ever reached their destination. But Columbus underestimated the size of the globe by a full two-thirds and therefore believed it was possible. After unsuccessfully shopping his proposed expedition in several European courts, he convinced Queen Isabella and King Ferdinand of Spain to provide him three small ships, which set sail in 1492. Columbus was both confoundingly wrong about the size of the Earth and spectacularly lucky that two large continents lurked in his path. On October 12, 149, after two months at sea, the Nina, Pinta, and Santa Maria and their ninety men landed in the modern-day Bahamas. The indigenous Arawaks populated the Caribbean islands. They fished and grew corn, yams, and cassava. Columbus described them as innocents. “They are very gentle and without knowledge of what is evil; nor the sins of murder or theft,” he reported to the Spanish crown. “Your highness may believe that in all the world there can be no better people … They love their neighbors as themselves, and their speech is the sweetest and gentlest in the world, and always with a smile.” But Columbus had come for wealth and he could find little. The Arawaks, however, wore small gold ornaments. Columbus left thirty-nine Spaniards at a military fort to find and secure the source of the gold while he returned to Spain to great acclaim and to outfit a return voyage. Spain’s New World motives were clear from the beginning. If outfitted for a return voyage, Columbus promised the Spanish crown gold and slaves. Columbus reported, “with fifty men they can all be subjugated and made to do what is required of them.” It was God’s will, he said. Despite the diversity of native populations and the existence of several strong empires, Native Americans were wholly unprepared for the arrival of Europeans. Biology magnified European cruelties many times over. Cut off from the Old World and its domesticated animals and its immunological history, Native Americans lived free from the terrible diseases that ravaged populations in Asia, Europe and Africa. But their blessing now became a curse. Native Americans lacked the immunities that Europeans and Africans had developed over centuries of deadly epidemics and so when Europeans arrived, carrying smallpox, typhus, influenza, diphtheria, measles, and hepatitis, plagues decimated native communities. Death rates tended to be highest near European communities who traveled with children, as children tended to carry the deadliest diseases. Many died in war and slavery, but millions died in epidemics. All told, in fact, some scholars estimate that as much as 90 percent of the population of the Americas perished within the first century and a half of European contact. Though ravaged by disease and warfare, Native Americans forged middle grounds, resisted with violence, accommodated and adapted to the challenges of colonialism, and continued to shape the patterns of life throughout the New World for hundreds of years. But the Europeans kept coming. 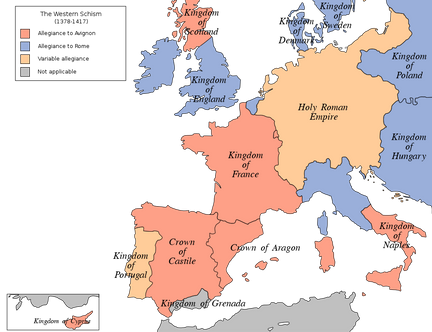 Below is the shift geographically from how Europe shifted from feudal kingdoms to nation-states.